Our heroine Zula is an Eritrean orphan adopted by an Iowan family, whose patriarch is a former smuggler turned head of T'Rain, a multibillion-dollar massively multiplayer online role-playing game. When her boyfriend's scheme to sell stolen credit card numbers goes bad, she becomes aware of REAMDE, a virus that holds players hostage in return for real money. This leads to a deadly global chase that includes a great cast of protagonists (Zula and her uncle, teenage Chinese hackers, a beautiful Chinese-British M16 spy, a plucky Chinese tea seller, a retired Russian military security contractor, a Hungarian hacker, and gun toting survivalists in Idaho) and villians (a rogue Russian mobster and jihadists following a charismatic and urbane leader). The characters bounce from Seattle to Xiamen, China to Taiwan to the Phillipines to British Columbia; are captured, fight, kill people, fall in love, commandeer boats and blow up buildings; and finally converge at the Canadian-US border mountains in an Afghanistan-guerilla-style showdown. And, oh yeah, there's a man-eating mountain lion on the loose. One of the parts I enjoyed the most was the intricacies of T'Rain, including the organic development of a style-based war (the Earthtones versus the Brights) to the dismay of the founders who were promoting a more conventional Good versus Evil storyline; the economics of virtual reality; and the ego clashes between two prolific, but possibly mediocre, fantasy writers of the game. "My uncle can get you across the U.S. border," she tried. She realized that Jones genuinely liked her. Was, at some level, looking for an excuse not to kill her. "No, really?" he asked. "The same uncle?" "The black sheep," he said, piecing it together. "The one you went to visit in British Columbia." "We're in the British Columbia," she reminded him. "I really must meet this chap," Jones said, switching to his sarcastic-posh accent. "Then if you don't mind," he said, "my four comrades and I are now going to be quite busy for a while, trying not to die. If we are able to string a couple of nonfatal days together, we may then return to your proposal." "How can I help?" Zula asked. "Stop killing people," he suggested. To read more reviews, check out my "Reviews" page, or find me on Goodreads or LibraryThing. I <3 Neal Stephenson--Cryptonomicon was my first, then Snow Crash and the whole Baroque Cycle (highly recommended for other 1000+ page readers), plus others. He's entertaining and educational all at once, not an easy trick, esp. in the long-form novel. He's so good at weaving together multiple plotlines involving amazing but believable characters. Now I've got another one to add to my reading pile! Thanks, Sylvia! Hi Mike. I also loved Cryptonomicon and Snow Crash. Anathem was another I really enjoyed. I couldn't get into the Baroque Cycle, but maybe I'll give it another try. Snow Crash and Diamond Age (as mentioned in my other comment) are my absolute favorites. I *think* I read Cryptonomicon ages and ages ago, so probably need to find some new (used!) copies. Cryptonomicon is still my favorite of his books. I loved the combination of history, codes and puzzles, plot, and heart. I love your art so I'm glad you're bringing forth more creations! 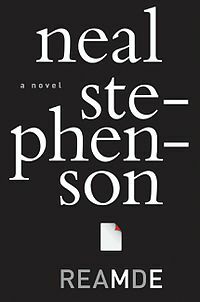 Neal Stephenson turns out another of his complex, high-tech high-adventure novels that ends far before I wanted it to end. While the scenarios are wild, he makes them seem the logical outcome of previous actions. His writing style is easy to read yet challenges me to think about what he says. Sometimes it's a bust-out laugh! I highly recommend this book; what fun it is!